The NRA High Power Long Range Championships kicked off on the 29th of July. 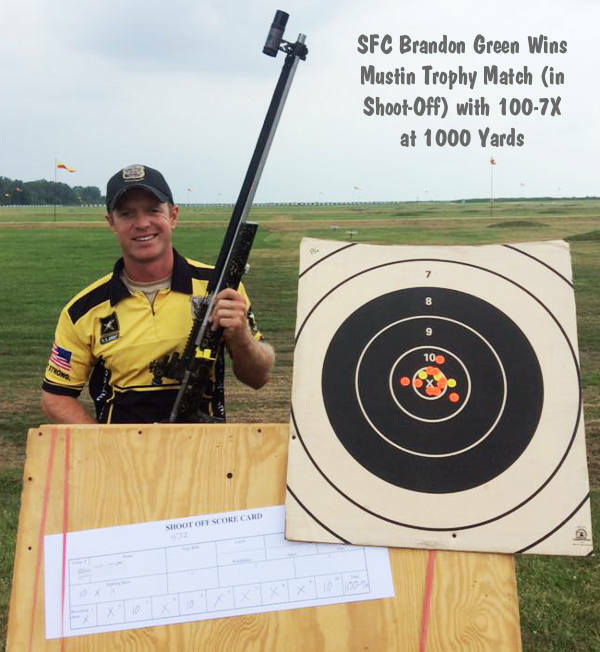 Despite challenging winds there were many impressive performances, including one by newly-crowned NRA High Power Champion SFC Brandon Green. The talented USAMU shooter traded his Across-the-Course Rig for his 7mm RSAUM prone rifle to compete in the series of Long Range matches. Brandon shot very well, finishing with a 100-7X in the final Shoot-Off to win the Mustin Trophy match. Shown at top is SFC Brandon Green with his long-range rifle. Note: the target in the photo shows the shot position for Brandon’s 10-shot Shoot-Off — all 10s and Xs. However, this is a REDUCED-SIZE target used for shot-marking (display) purposes only. The actual 1000-yard NRA Long-Range Target has a 10″ X-Ring, and a 20″ Ten-Ring. So the group of shots shown is much smaller than Green’s actual shots on the real 1000-yard target. Nonetheless this was a very impressive string for a sling-shooter using iron sights. If you’re curious about Green’s long-range rifle, it is a 7mm RSAUM with an Anschutz trigger in a Robertson Composites prone-style stock. This rifle features iron sights, but when USAMU shooters participate in scoped “any sights” competitions, they normally use Nightforce NSX scopes, according the USAMU coach SFC Emil Praslick III. Conditions were far from easy on Day 1 of the Long Range Championships. Here is a shot taken through a 25X spotting scope by Kevin Thomas of Lapua. Take a look at those flags swinging at different angles. Based on what you can see, what’s your wind call? 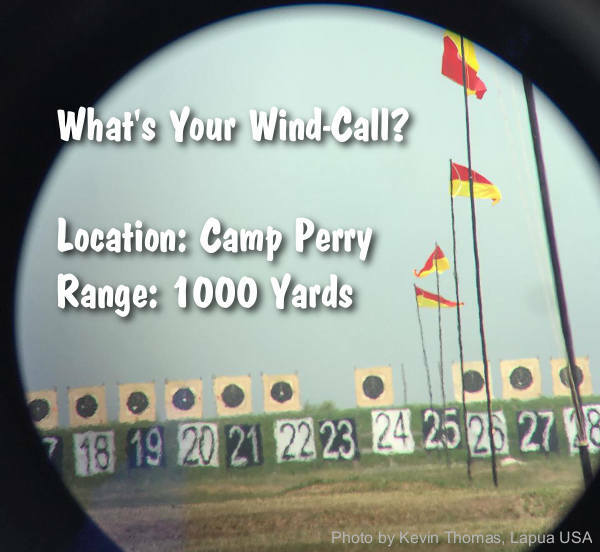 Share the post "Long-Range Championships at Camp Perry"
Warner Tool Company (WTC) has introduced a new series of “Flat Line” ultra-high-BC bullets. These sleek, lathe-turned solids are some of the most perfectly-streamlined projectiles ever sold. The Ballistic Coefficients (BCs) of Flat Line projectiles are as much as 20% higher than other match bullets of similar caliber and weight. 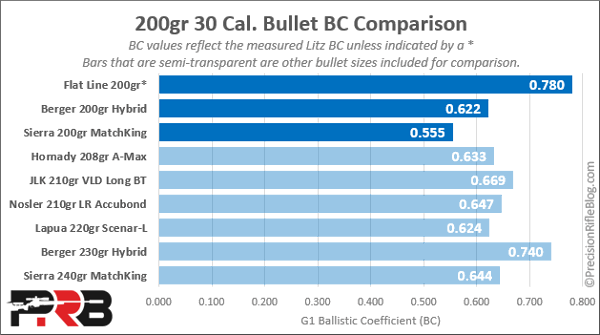 For example, the .30-caliber 200gr Flat Line bullet has a claimed G1 BC of 0.780. Compare that to 0.555 for the Sierra 200gr MatchKing and 0.622 for the Berger 200gr Hybrid. WTC also claims that Flat Line bullets can be launched at faster velocities than other bullets of similar caliber and weight. In its marketing materials, WTC says that Flat Line bullets deliver “Higher velocities when compared with projectiles in its weight class [and] much higher velocity when compared with projectiles of similar BC.” For example, WTC claims that “the 155.5gr .30-caliber bullet has the velocity of a 125-135gr bullet [with] the BC of a 185-200gr bullet.” It will be interesting to see if these claims can be verified in field tests. Cal Zant of the Precision Rifle Blog has obtained some early-production Flat Line bullets from their designer, Josh Kunz. Zant has written a lengthy article explaining the design and features of the new Flat Line bullets. If you are considering ordering some of these new lathe-turned solids, you should definitely read Zant’s report. 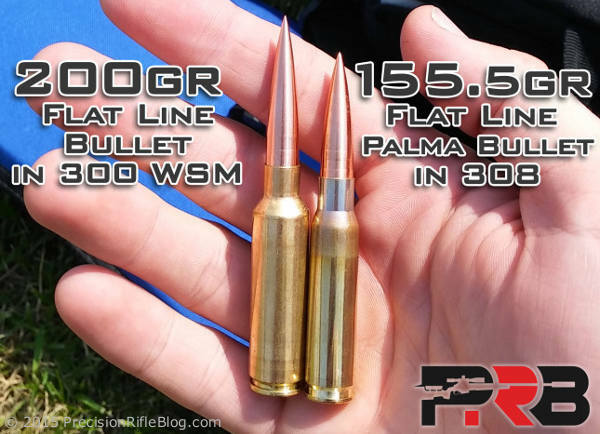 READ Flat Line Bullets Product Report in Precision Rifle Blog. These bullets were designed by Aerospace engineer Josh Kunz using advanced computational fluid dynamics (CFD) to simulate supersonic air flow around the bullets. Through the use of advanced modeling and precision CNC machining, Kunz has developed extremely uniform, ballistically “slippery” bullets that fly faster and flatter than other projectiles of similar weight/caliber. These new Flat Line solid bullets are pricey. The 155s cost $1.25 per bullet and the price goes up from there. If you need large quantities of projectiles for a week-long match, the cost can be daunting. One hundred fifty of the 200-grainers will set you back $435.00! Here is a price list for the new Flat Line bullets. All quantities are in boxes of 50. Pricing is introductory and subject to change. Is the cost worth it? When you look at the overall expense of attending a major match, and the fact that the top places in big matches are sometimes are decided by a single point (or X-Count), some competitors will spend the extra money for these ultra-high BC solids. For more details or to place an order, visit Warner-Tool.com, call WTC at (603) 352-9521, or email info [at] warner-tool.com. CLICK HERE for WTC Flat Line Bullets Data Sheet (PDF). Photos and Comparison Chart copyright PrecisionRifleBlog.com. Story tip from EdLongrange. Share the post "New Ultra-High-BC, Solid Bullets from Warner Tool Company"